Demographers predict that in 16 years, the United States will be home to 72 million older persons, more than twice the number in 2000, and it is estimated that 10,000 people reach the age of 65 every day. Statistics show that baby boomers control more than $13 trillion in household investable assets and as the population ages, the amount of wealth concentrated in the hands of older investors will increase. Unfortunately, for many people, aging is accompanied by diminished capabilities, including a diminished ability to assess and manage financial assets and resources, as well as a heightened susceptibility to financial exploitation. Protecting older investors has been a long-standing priority for NASAA and its members, making senior investor protection, in light of the trend of diminishing capacity and senior financial exploitation, of keen importance. As part of its ongoing effort to address the aging of America, NASAA formed the Senior Issues and Diminished Capacity Committee (Seniors Committee) in 2014 to undertake certain initiatives aimed at addressing these issues. 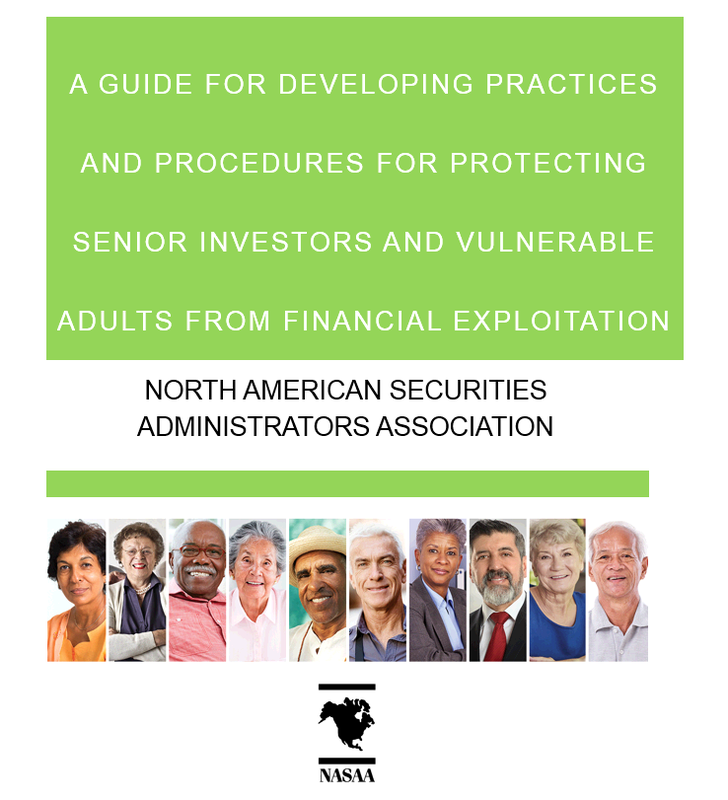 Consistent with the Seniors Committee’s work to develop informational guides for the securities industry, NASAA has prepared this document to provide broker-dealers and investment advisers with useful information for detecting, reporting, and mitigating senior financial exploitation. Included are suggested practices firms may implement that are designed to detect and address instances of diminished capacity in senior and other clients. This Guide is designed to complement the recently adopted NASAA Model Legislation or Regulation to Protect Vulnerable Adults from Financial Exploitation (NASAA Model Act). With the promulgation of the NASAA Model Act and its ongoing adoption as state law, coupled with clients’ aging and diminished capacity, firms should review their policies and procedures applicable to the issues that may arise in dealing with the accounts of seniors. Having up-to-date policies and practices in place that address potential cases of diminished capacity and financial exploitation will better equip financial services professionals to: 1) recognize diminished capacity and financial exploitation; 2) understand when and how to escalate reporting of such issues within a firm; and 3) direct reports to governmental agencies that can conduct additional investigations and provide needed services. This Guide highlights certain requirements and options available under existing state laws, NASAA’s Model Act, and voluntary practices, coupled with suggestions on how firms should develop policies and procedures to mitigate potential damage caused by senior exploitation and issues related to cognitive decline or diminished capacity. The Guide is structured around five key concepts: 1) identifying vulnerable individuals; 2) governmental reporting; 3) third-party reporting; 4) delaying disbursements from client accounts; and 5) continuing regulatory cooperation following reports or disbursement delays. This Guide was compiled after substantial research, including interviews with securities industry associations representing broker-dealers and investment advisers, advocacy organizations for seniors, and other organizations representing agencies on the front lines of addressing senior financial exploitation and diminished capacity issues. NASAA also reviewed and analyzed existing reports and information on this important topic. Where appropriate, this Guide references NASAA Model Act provisions in an effort to assist in implementing its requirements or other similar state laws. This Guide, however, does not create or modify existing regulatory obligations with respect to senior investors, and does not catalog the full range of compliance practices applicable to senior investors. Rather, this Guide focuses on steps that firms can take to identify and respond to issues that are common in working with senior investors and are likely to assist firms in utilizing the new statutory tools available to address issues related to senior financial exploitation and diminished capacity. We hope this Guide encourages financial services firms to continue to identify and implement additional practices that address the particular needs of senior investors.